Quite rightly, most briefs we receive ask about how we will engage stakeholders. This is a vital request; meaningful insight needs to create traction in your business – and stakeholders must be onboard. 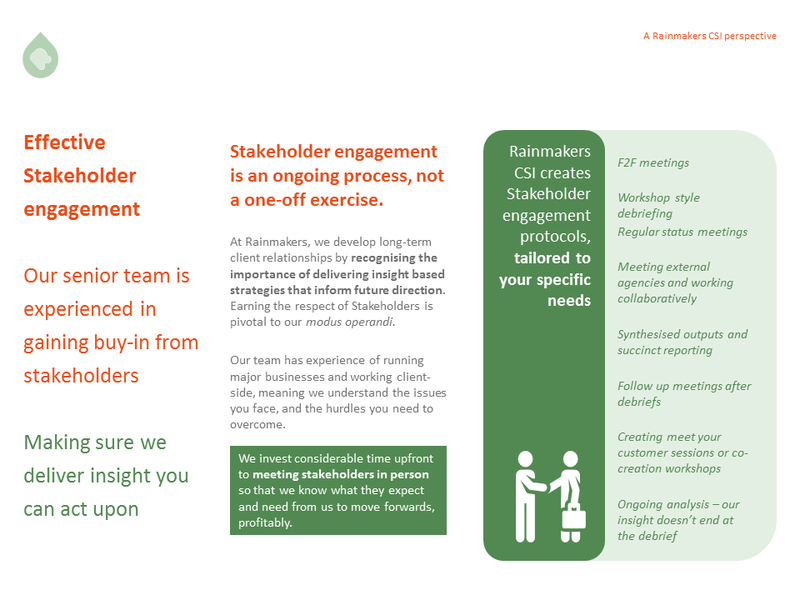 At Rainmakers CSI, we live and breathe stakeholder engagement. We truly believe it’s the only way we can achieve our goal to help you to grow profitably. But, we can only do this by earning your respect, and the respect of your stakeholders. Our senior team includes people who have worked at the top table in, and for, successful businesses. So, we understand what it takes to turn insights into the actions everyone needs to sign up to. And, we mean everyone; we engage with all your pivotal contacts and decision-makers – from the shop floor to the board room, from customers to buyers, from rejectors to advocates, from thought leaders to slow adopters. Basically, anyone and everyone who can influence how you will grow. Our take on stakeholder engagement isn’t about a one-off meeting, portal, app or workshop. Instead, our way centres on listening, understanding and delivering – not only at kick-off but on a continual basis. We do this by talking commercially at every touch point and by getting to grips with your big decisions, up front and as they evolve. This approach is why we’re retained by major global brands and fast-growing, mid-sized companies; it’s why we’re invited to strategy sessions and customer meetings; it’s why our clients use our commercial application of insight wherever possible. Our insight and consultancy advice never ends with a debrief. We commit to engaging with you and your stakeholders to deliver substance that endures; substance that drives profitable growth, both now and long-term. See below for our quick guide to developing real stakeholder engagement. And here if you’d like to contact Rainmakers about discovering how to create sustainable, profitable growth – with everyone onboard.